teach and model for your child everything you know about self-care and good nutrition. Listen, listen, listen to your child’s feelings and concerns. Respond and then listen some more. Trust and follow your best instincts. Present a united parental front and do so intelligently, sensitively. Use your collective power appropriately, supportively, for the good of your child and family. Remember that you are your child’s parent for life, no matter what his or age. Understand that these problems reverberate throughout the wider family system. Siblings need to be considered and attended to as well as the disordered child. Get help. Make sure it is with the best and most experienced professionals and that they respect your role as child advocate and mentor to the healing process. Remember that if one approach doesn’t work, there is always another way. Chapter One helps you learn everything you need to know about eating disorders. It is important to become educated about these diseases both for yourself and for your child, who needs to learn what you know. Chapter One explains that eating disorders are not about food. That they are disorders of thinking and coping, of behaviors and feeling, of lifestyle and relationships. This chapter dispels the many myths surrounding these diseases. The most pernicious myth is that parents are the cause of these diseases in their children. See page 211 to learn more about the infinite wisdom of the human body. Chapter Two assists you in recognizing disease in its earliest stages. This is key to eating disorder prevention or bringing about the most timely and effective cure. This chapter discusses how to distinguish eating pathology from an otherwise benign “quirk,” and how to recognize the earliest signs of a disorder-in-the-making through so many diagnostic “smoke screens.” This chapter looks at your own capacity to accept the reality of an eating disorder in your child. Chapter Three describes how best to intervene with your child, how to listen to really hear what (s)he says and feels, and how to deal with his or her confusion, resistance or denial. Of particular interest in this chapter are the exercise on pages 71and 72 (Recognizing What Your Child Considers Supportive) and the sample dialogue between parent and child contained in pages 83-85. The latter allows the parent to anticipate and rehearse what he or she needs to convey during a most critical intervention. This chapter also describes how to deal with potential power struggles and supplies options in the face of a child’s non-compliance. Chapter Four discusses everything you need to know about treatment approaches, modalities, milieus, and options. It discusses what therapy is about and how change happens, goal setting and problem-solving, what therapists do and how they do it. It describes what you and your child can anticipate and expect from treatment, preparing you for the critical treatment process so that you can prepare your child. Chapter Five empowers parents to know what they are looking for in professional help and to be assured that they get it. Pages 136-139 help you to conduct an effective initial telephone interview in your search for the best assistance for your child and family. It describes the composition and function of the treatment team, of which you as parents should be a part. This chapter offers suggestions about how to talk to your child’s professionals, what to ask, expect and demand of them. It red flags problems to beware of in choosing professionals, strategies for dealing with insurance companies, and tips for evaluating the success of the therapeutic process. Chapter Six describes the unique and seemingly random and unpredictable eating disorder recovery process. Contrary to what many think, 80% of people who are treated early and effectively recover from eating disorders and stay recovered. Recovering from an eating disorder is a complex and many-faceted process which defies expectations. Having recovered from an eating disorder marks the beginning of emotional maturity and the capacity for a fulfilled existence. When your child recovers from an eating disorder, he or she is no longer a victim. It signifies increased options and the patient’s capacity for responsible problem-solving. See pages 194-195. Chapter Seven addresses the phenomenon that eating disorder recovery is normally a prolonged process that is highly susceptible to stalls and derailments. This chapter advises parents about how to evaluate and troubleshoot treatment and recovery glitches and problems, and how to intervene with child and professionals to facilitate healing. It also discusses the significant role that siblings play. Make special note of the appendix devoted to the eating disordered child who is going off to college, as well as to the comprehensive section listing resources which are for the benefit of parents, patients, and professionals. Fortunately for all of us, there is a lot of room for forgiveness when it comes to loving and well-intentioned parenting. None of us are perfect; we all make mistakes. The lessons we learn from our mistakes are often the most valuable that life has to offer. Our gravest problems, however, arise less from our mistakes, but more in not responding to them in appropriate, effective and proactive ways. Herein lies our most poignant modeling for our children. 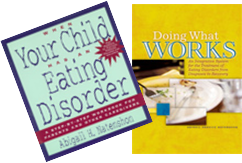 When Your Child Has An Eating Disorder: A Step-by-Step Workbook for Parents and Other Caregivers is a book for parents, as well as for children, for patients and their siblings. Children at a loss for how to explain their condition to their parents may use the book to inform and educate their parents, just as parents may use it to educate and inform their children. Similarly, the book can be used by spouses for their partners, who may need help in explaining a complex disease and/or healing process. 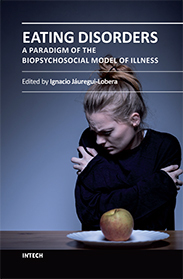 This is also a book that serves as an invaluable resource for physicians and mental health professionals, for patient educators, nutritionists and school personnel. Consider asking your child to respond to the questionnaires and tests independent of your own efforts. Note where there might be discrepancies in perception and don’t hesitate to use those discrepancies to your advantage, as incentives or jumping off points for dialogue, problem definition, and problem resolution.